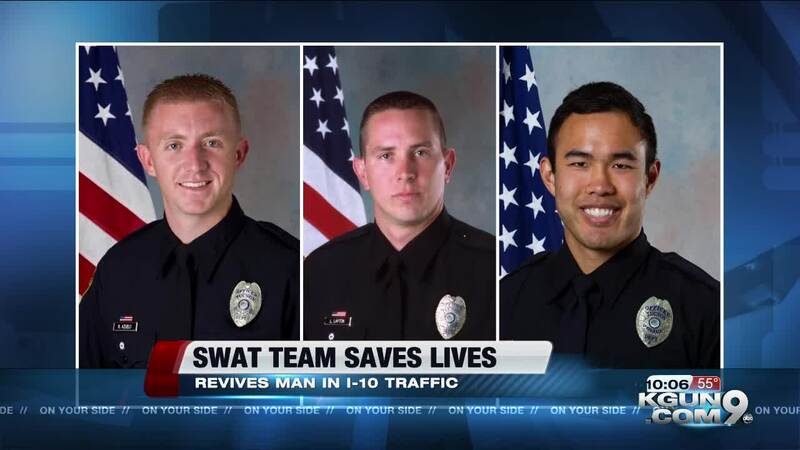 Tucson SWAT Officers are being credited for saving a life in the fast lane. According to the Tucson Police Department, on Oct. 17, two off-duty SWAT Officers, Officer Azuelo and Officer Lee, were on their way home from SWAT School when they noticed a pickup truck that was stopped on the I-10 in the westbound lane, between Valencia Road and Alvernon Way exits. Azuelo and Lee pulled over to help the driver of the pickup who was unresponsive behind the wheel. Another SWAT Officer, Office Layon and Tucson Fire Department Assistant Chief Garcia were in the area and stopped to help. They pulled the driver from the truck and found he was not breathing. Azuelo and Lee began performing CPR in the dirt median, doing four rounds of CPR until the Rural Metro Fire Department responded. The medics used an AED to start a heartbeat again. The driver was transported to the hospital. At the hospital, doctors determined the driver had suffered a massive heart attack. The Tucson Police Department says they couldn't be prouder of their officers and their brothers in the Tucson Fire Department.